PHOENIX, Ariz.—Maricopa County Recorder Adrian Fontes's (D.) answers to questions about controversial emergency voting centers opened on the Saturday and Monday before Election Day only inspired more criticism from Republicans, who consider the centers workarounds for voting election deadlines set by law. The debate over Maricopa County's logistical decisions comes as ballots continue to slowly be counted in Arizona's Senate contest. 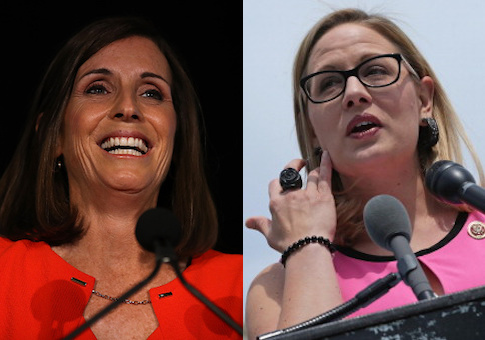 On the Wednesday following Election Day, Republican congresswoman Martha McSally led Democratic Rep. Kyrsten Sinema by over 17,000 votes. However, there were also about 650,000 votes still to be counted, with the majority of those in Maricopa County. As of Monday, Sinema has a lead of about 32,900 votes, and the Arizona Republic estimates 215,000 votes remain to be counted across the state. By law, early voting is supposed to end on the Friday before Election Day, but the law also provides for the emergency voting centers that may be created after. Ambiguities over the "emergency voting" statute—including questions as to what constitutes an emergency and whether or not a voter should have to prove their emergency—are the points of conflict. During "Sunday Square Off" on local NBC Affiliate 12News, political reporter Brahm Resnik pressed Fontes on the decisions, first by asking about the locations of the emergency voting centers, and whether the locations favored Democrats. Resnik: How fair is this when vast swaths of the valley [Phoenix metro area] – and maybe some Republican districts, some might argue were left out of these voting centers—while you have two very close to each other in a Democratic area? Fontes: Here's what's interesting about this. On the one hand we have people complaining that I shouldn't be doing something in the first place. And on the other hand when I do it, they criticize me for the way it happens. And that's fair. I'm an elected official, and I've got big shoulders. 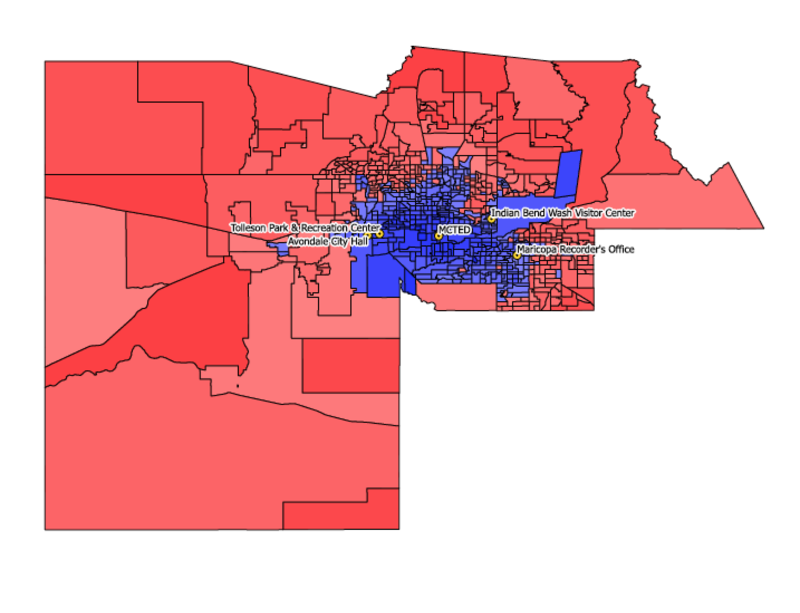 The following image, provided by the Arizona Republican Party, shows precinct-by-precinct results for Maricopa County for this election, and also shows the location of the emergency voting centers. Fontes then went on to describe the locations of the emergency voting centers, and said he got a request from an elected official for others, with the request he said coming "very close to the last minute." The request from the elected official was the mayor of Tolleson, who endorsed Sinema almost a year before the election. Then Resnick asked about the ambiguities around the emergency voting statutes. Resnik: But this is the first time Maricopa County did it. Resnik: And I could have gone, without any illness and – for any reason I could have gone to one of these centers for any reason at all. Fontes: You would have had to had an emergency. Resnik: Are you sure about that? Resnik: Uh, Democrat candidates were putting this number and address out on door hangers saying, ‘Just show up.'" Fontes: The law says you can have emergency voting available, if a voter has an emergency. Resnik: You weren't checking for emergencies at the door. Fontes: It's not my business what your emergency is, Brahm. I've got HIPPA [health privacy laws] laws that prevent me from asking. You've got your privacy that I have to respect, and by the way, what, pray tell, is the problem with giving voters access to the ballot box? That's my first question. Continuing its criticism of the controversy, the Arizona Republican Party Sunday morning tweeted out a Fox News interview with election law attorney and former Maricopa County prosecutor Tim La Sota. "Tim La Sota: Democrats are not concerned with counting votes, they're concerned with counting their votes. #AZSEN" the tweet read. After the emergency voting locations were open on the Saturday before Election Day, Republican officials sent letters to every county recorder in the state about concerns they had over the legality of some processes which were underway, but singled out Maricopa County in particular. "It has come to our attention that the Maricopa County Recorder's office may be systematically permitting electors to cast in-person early ballots between Saturday, November 3 and Monday, November 5, irrespective of whether such individuals have cited any articulable 'emergency,'" the letter said. "If true, this practice impermissibly circumvents the statutory deadline and constitutes a de facto extension of general early voting." The GOP asked county recorders to segregate all ballots cast in emergency voting centers, in case more legal questions arose. The Arizona Republic reported on the letter saying that "[Fontes] would not confirm whether the office is complying with the request and separating the ballots." The same report estimated that about 3,000 ballots were at issue. After election day, the GOP straightforwardly accused Fontes of destroying evidence by not segregating the ballots as it had requested. Fontes has maintained that a "plain reading" of the election law and the emergency voting statutes support his decisions. This entry was posted in Politics and tagged 2018 Election, Kyrsten Sinema, Martha McSally. Bookmark the permalink.